Russia’s Olympic medal drought is over – and all that remains is to discover whether Oleg Znarok’s team will win gold or silver in Sunday’s final against Germany. February 23 is Defenders of the Fatherland day in Russia, and goalie Vasily Koshechkin provided a sterling defense of his net. The Metallurg man made 31 saves to frustrate the Czech offense and secure a 3-0 victory for the Olympic Athletes of Russia. A cagey game hinged on a quickfire two-goal salvo in the second period, with Nikita Gusev and Vladislav Gavrikov scoring to lift the Russians through to the Grand Final. Ilya Kovalchuk added an empty net goal to wrap up the victory. Having assured the country of its first hockey medal since bronze in Salt Lake in 2002, Russia now has the chance to claim its first gold since the Unified Team of former Soviet nations took the prize in 1992. The decisive passage of play came in the middle frame. The Czechs had stuck to their game plan of trying to frustrate the Russians, but in the 28th minute Pavel Datsyuk unpicked the locks on Pavel Francouz’s net. His vision picked out Nikita Gusev, unmarked at the back door. Gusev took one touch to set himself, then another to lift the puck over the Traktor goalie’s shoulder. Czech coach Josef Jandac appealed for goalie interference, but Kirill Kaprizov’s presence in the Czech crease was due to a shove from Vojtech Mozik and the goal stood. Datsyuk shrugged off the praise for his assist: “It’s forgotten already. We need to get ready for the final.” Gavrikov, meanwhile, was never worried when the play went to a review. “I could see that the defenseman pushed him in there,” he said. Having got in front, Russia doubled its lead within 30 seconds. The Czech offense coughed up the puck in the Russian end, Mikhail Grigorenko fed Ivan Telegin and the CSKA forward charged down the ice before picking out Gavrikov for a routine finish after he advanced from his usual defensive role. In the final frame, Koshechkin made two big pad saves to deny Petr Koukal as the Czechs found themselves unable to get a bounce around the net. With the Russian D battling away and doing the ugly jobs – blocking shots, chasing rebounds – there was simply no way through for Josef Jandac’s team. Kovalchuk’s empty-netter wrapped up the show, moving him to third place in the Olympic scoring race behind Eeli Tolvanen and Nikita Gusev. 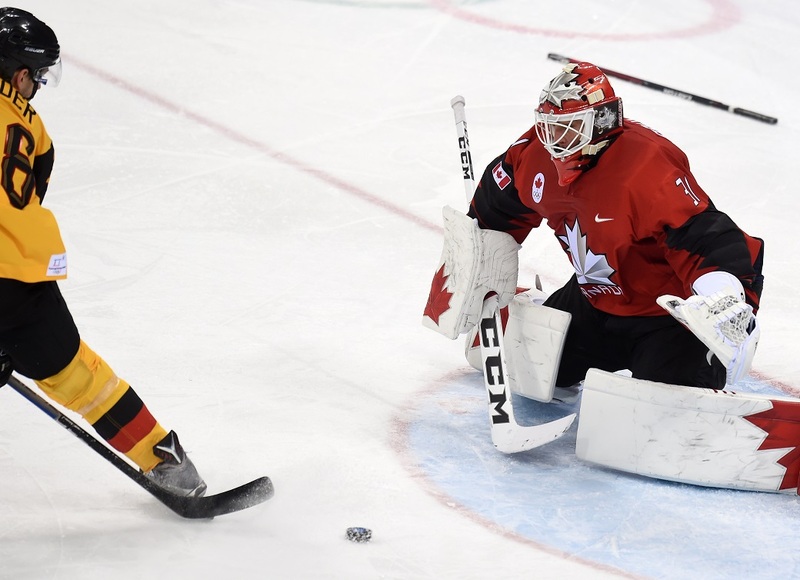 “Miracles do happen!” Just ask Marcus Kink, German defenseman, after his team’s sensational 4-3 victory over defending Olympic champion Canada. Nobody believed the Germans could make an impact at these Games – but the Cinderella story is going all the way to the ball. Against Canada, they did just that. Backstopped by Danny aus den Birken and throwing everything on the line on defense, the Germans were good value for their win. They started by shutting Canada down in the first, then capitalized on a 5-on-3 power play to take the lead when Brooks Macek shot past Kevin Poulin, starting goalie ahead of the injured Ben Scrivens. But it was the middle frame that saw the game disappear from Canada’s reach. Matthias Plachta doubled the lead, then Frank Mauer produced an audacious close-range finish to make it 3-0. Kunlun Red Star’s Gilbert Brule got one back for Canada on the power play, and it felt like the dream may yet end too soon. But when Patrick Hager smashed home a one-timer to make it 4-1, and Brule was ejected from the game for a high hit, the task ahead of the Canadians was just too great. They tried. Mat Robinson (CSKA) got an early goal in the third, Poulin saved a penalty shot from Dominik Kahun to keep his team in contention and Derek Roy, ex Avangard and Traktor, got the bounce when he drove the puck in off a German skate … but it wasn’t enough. “The first period wasn’t our game, that’s not how we play,” said a disappointed Robinson. “It was only 1-0, we should have been able to regroup there but we took lots of penalties in the second, that didn’t help our cause on the comeback. 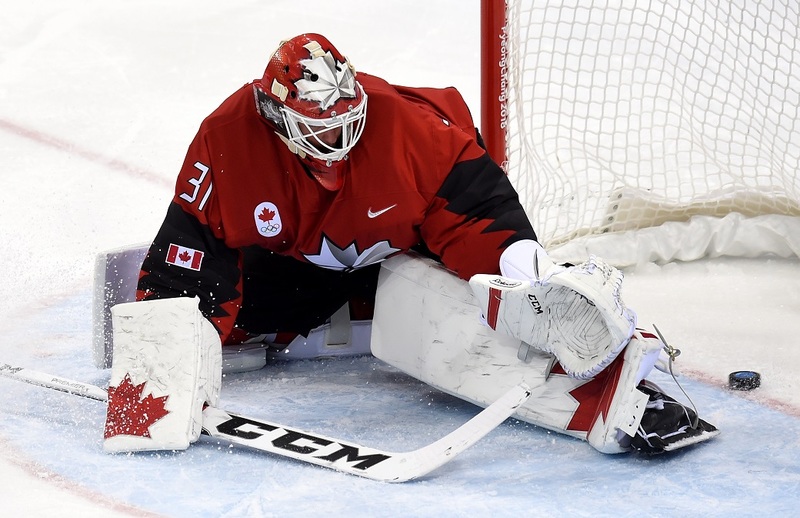 Canada’s bid for a third successive gold came to an ignominious end; the expected dream Russia-Canada final was denied. But for Germany, now guaranteed its first Olympic medal since bronze in 1976, this was a night to savor. Head coach Marcus Sturm said he felt “blessed” as his team keeps on daring to dream.